X-30R refrigerated model cools from room temperature to 4° C in fewer than ten minutes and has an operating temperature range of 2° C to 40° C (35° F to 104° F). 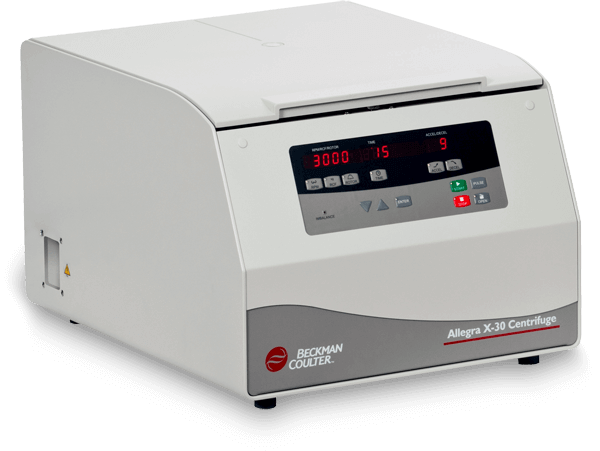 The X-30R provides excellent performance and easy operation in a compact design that saves valuable time and laboratory space with the highest speed and g-force in its class (1.6L max capacity, 18,000 RPM, 29,756 x g). Simple and quick run setup. Versatile, with an extensive rotor library for multiple applications, plus a compact Design of only 18" wide (46cm). Includes a BioCertified* swinging-bucket and fixed-angle rotors. Rotor details: Three ways to spin the 1.5 mL PCR Tubes; Biocertified* 24-place fixed-angle rotor - 29,756 x g; 30-place fixed-angle rotor - 28,672 x g; 24-place swinging-bucket rotor - 16,244 x g for flat pelleting. One rotor spins 500 μL to 1.6 L; 4 x 400 mL - maximum capacity; 4,700 rpm - 4,255 x g - maximum g-force; 20 adapters. Spins the following labware: 400 mL bottles; 250 mL bottles; 100 mL, 94 mL, 85 mL bottles; 50 mL conical and round-bottom tubes; 15 mL conical and round-bottom tubes; 30 mL, 25 mL, 10 mL tubes; 1.5 mL and 500 μL PCR tubes. *BioCertified is a term used to describe products tested and validated to demonstrate containment of microbiological aerosols by an independent, third-party facility (Health Protection Agency, Porton Down, UK or USAMRIID, Ft. Detrick, MD, USA). Improper use or maintenance may affect seal integrity and, thus, containment.